Check first if the operating system is supported by the hardware. If your PC or laptop is old, do not use a latest operating system for it. Some of the drivers doesn’t have support in latest versions of windows. If you don’t have a proper drivers installed, it may cause problems or you can’t use the device properly which may slow down your computer. If you’re using a new PC then you can use the latest version and run the computer smoothly. Another factor with the operating system is the CPU architecture and the ram… If the cpu of your computer is specifically for 64Bit, then I suggest you use a 64Bit operating system. You can still use a 32Bit Operating system but to use the CPU at full extent then use 64 bit operating system. Also if your ram is higher than 2 GB check if you’re using a 64Bit Operating system. Using a 32 Bit operating system on 4GB RAM and Higher is a waste of RAM. If you’re using a proper operating system for your computer and still your computer is running slow then check the computer specs. Check the Specifications of your computer before trying to speed it up. Some computers might get very slow even with just an operating system and an antivirus software is installed. The minimum specs of the computer to run smoothly with browser, word processing applications, antivirus software or low end games is dual core processor with atleast 2.0Ghz clock speed, atleast 2 GB of ram. Check if your computer is heating up. When the CPU is heating up it will automatically limit the usage of processor to prevent over heat. Limiting the usage of processor means slower computer. This is common with laptops. Before I speed up any laptop I always check if the temperature is normal. If it’s hot, then there must be some dirt blocking the exhaust of the CPU that causes it to limit the usage of the processor. My advice is to open up your laptop and remove the dirt specially on the exhaust and check the difference. When you open a file and takes longer than usual. Always disk checking on startup. Blue screen or suddenly restart. When you run application and takes a while. When your hard disk produces some noise. Lost / Corrupt Files / Missing Files. So many programs on start up. How to deal with viruses? The best thing to do is to download malwarebytes free. This is the best way to remove viruses on your computer. I always use this program to remove malwares and viruses successfully. If your’e running microsoft windows operating system, then the best antivirus software for you is Microsoft Security Essentials or Windows Defender. Why? Because it’s made by Microsoft itself for their operating system and they know whats best for it. Just don’t forget to update the virus definitions then you’re good. The most important part of speeding up your computer is coming up next. How to Optimize your PC for Best Results. To disable unwanted start up items, press Windows+R then type msconfig to show system configuration window. Then click to startup to view startup items. Uncheck the programs you want to remove on startup then click apply. Note: Do not remove antivirus applications on start up for your security. On windows 8 and 10, the startup items are placed on task manager so to disable startup items you need to press CTRL+Shift+Escape to open task manager. then navigate to start up then disable the programs you want to disable. To disable unwanted services, press Windows+R then type msconfig to show system configuration window. Click services and check hide all Microsoft Service to hide important mircosoft services. Uncheck all unwanted services running. Don’t uncheck your antivirus programs. 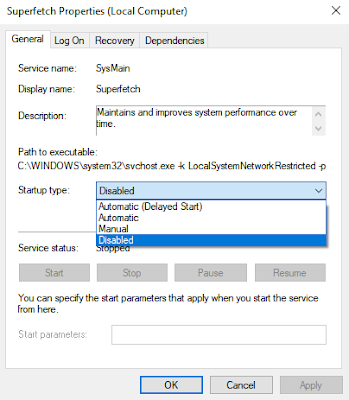 Disable superfetch can speed up your computer. SuperFetch tries to make sure often-accessed data can be read from the fast RAM instead of the slow hard drive. It really sounds good but a bunch of files Staying on RAM is not specially when you have a lot of files you use regularly. On start up it automatically loads a bunch of files to your RAM from your hard disk so automatically you will experience slow start up with this enabled. Click Ok then the services window will appear. then go to startup type then select disabled. Click Apply and ok then restart your computer to see the difference. That’s the factors that affect the speed of your computer. Again you must check the specs of your computer, the operating system, check for virus infections, check the temperature of the computer and optimize it for better performance. If you need help or assistance just message me using the messenger icon on the bottom right of your screen and I’ll get back to you asap. Thanks for reading.